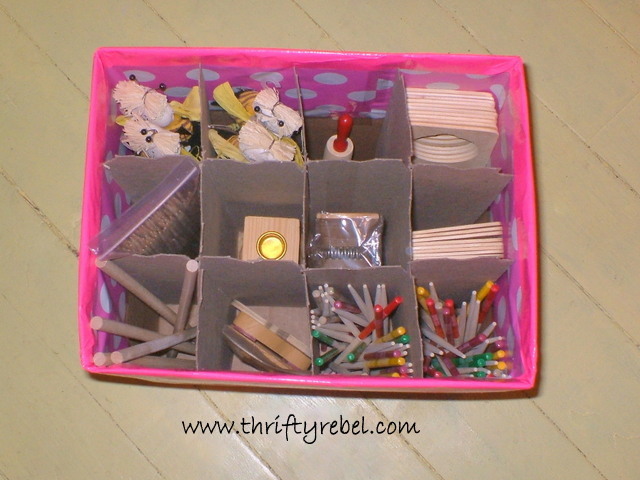 You are here: Home / DIY Storage and Organization / The Best Craft Room Storage Boxes… Free! 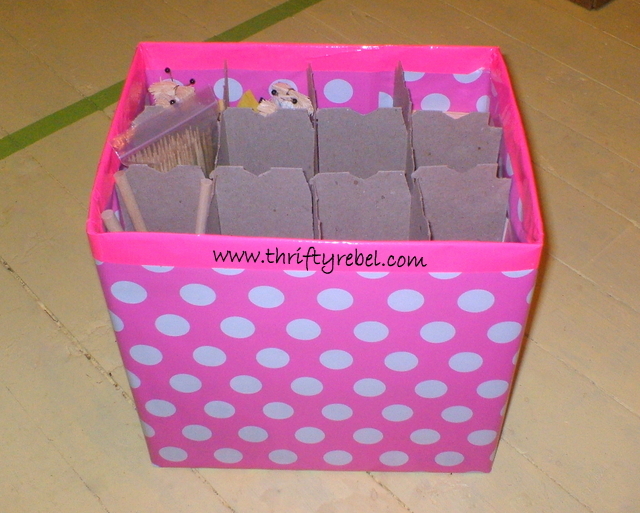 The Best Craft Room Storage Boxes… Free! 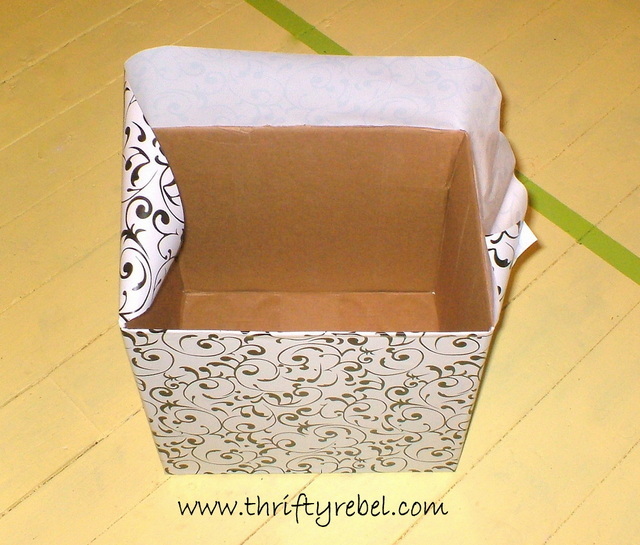 You don’t need to buy expensive fancy boxes to get great storage in your craft room. Just visit the local liquor store. The boxes I get there aren’t just inexpensive… they’re free. At least here anyway. The only expense comes from how you decide to cover them. 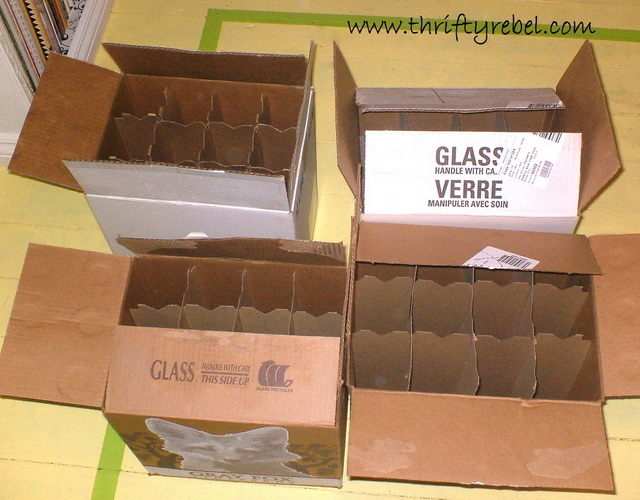 I popped into the liquor store in the town where I work and grabbed these great cardboard wine boxes… for free. And no, they didn’t come with the wine in them. Too bad I know. 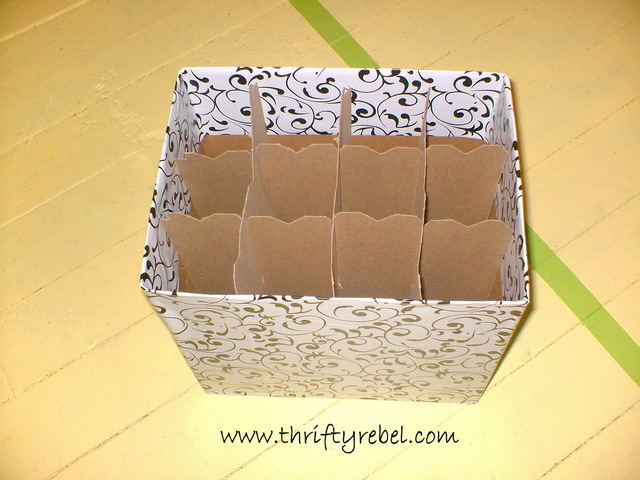 But they did come with these fabulous cardboard dividers, which are so great for organizing and storing all kinds of things. And the nice thing about them is that because they’re made to carry bottles they’re very strong. Well he may be cute, but I didn’t want to be looking at him all the time… and I was afraid he might scare my cats when they come visit me in my craft room. So he had to go. I cut off the top flaps to give me easy access to the items I’ll be storing. They can certainly be kept if you like. 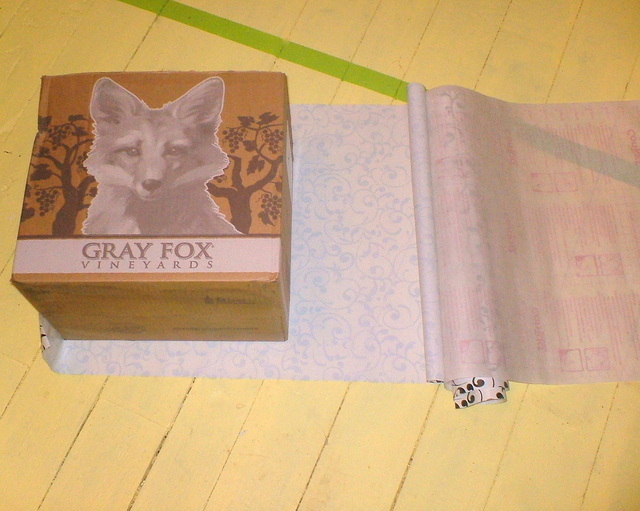 Then I grabbed some of the left over self adhesive vinyl contact paper, which I also used on my craft desk and the shelves of my built in bookcase, and lay the box down on top of it. I rolled the box across the contact paper, smoothing each side before moving to the next… until I had all 4 sides covered. I removed the cardboard dividers from inside the box, cut the corners of the contact paper, and folded them inside. I did the same thing to the bottom. And here’s my finished box. 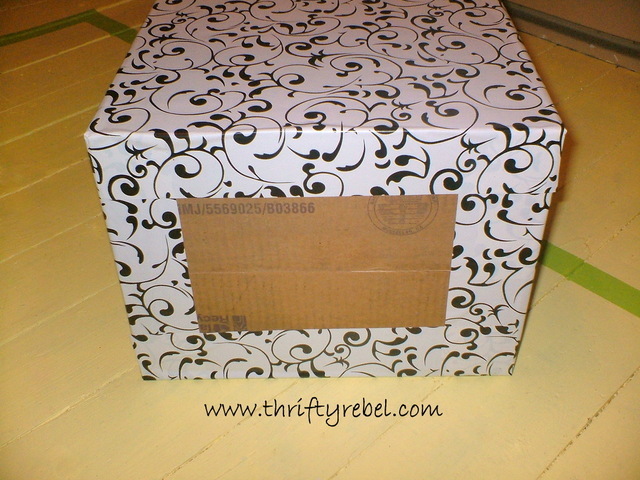 Here’s a box that I covered with some dollar store pink polka dot wrapping paper. I secured the paper with regular clear packing tape, and trimmed the top with pink duct tape to protect the edges. It’s filled with some wooden craft items that I thrifted a while back. I can totally see storing rolled up fabrics in these as well. 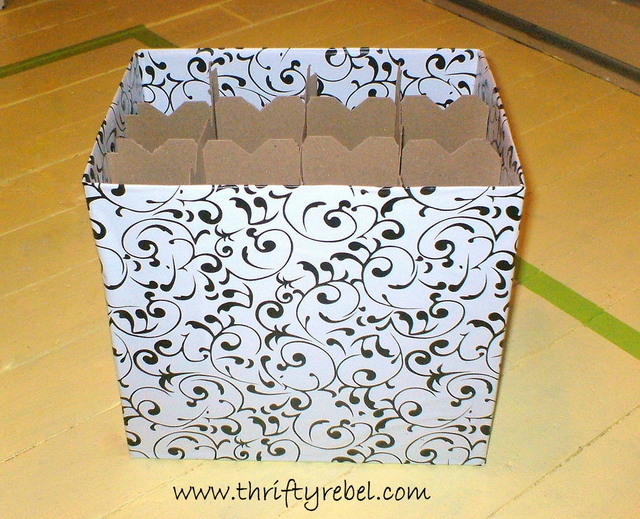 And here’s one that I use to store some Christmas decorations. I haven’t covered this one with anything yet, but I just wanted to show you the great storage options of these boxes. 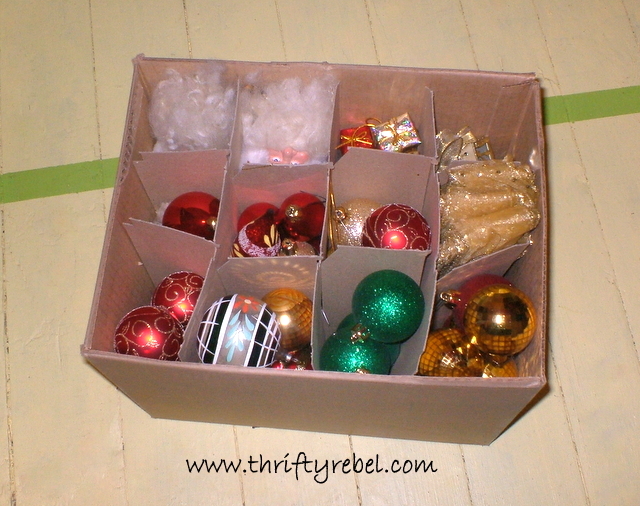 They’re also great to use when moving (which we did quite a few times before this house) for packing glassware, knick knacks etc. I’ve always loved using them because there’s no need to wrap things, saving a ton of time and hassle. I definitely wouldn’t recommend letting movers handle these boxes though, but we always moved ourselves so it’s never been an issue. Have a fabulous day, and thanks so much for reading. On Monday afternoon the near-by liquor store throws all the boxes out for people to grab. Some of the graphics are neat enough to display. In my first apartment in 1976, I covered boxes to use as end tables. Freebie idea – thanks, Tuula! I have a crazy box fetish! I usually use fabric but I think I might try some contact paper too. I have three rolls left over from a previous project. 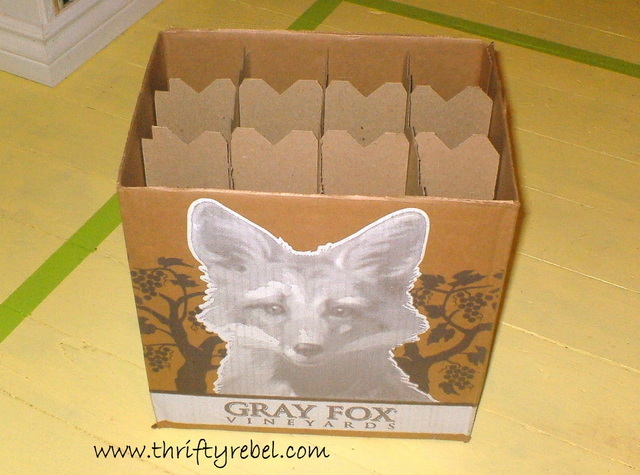 I never thought of liquor store boxes. They would definitely be stronger that the average box. Thanks for a great tip Tuula!! Those look awesome. I love how they are divided and can organize so many different things. Good thinking! 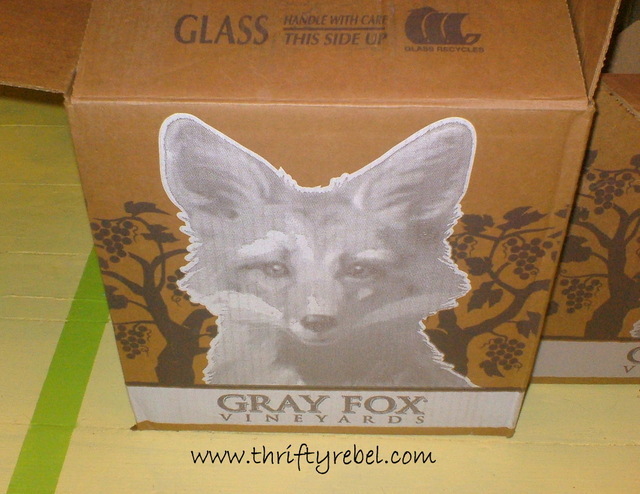 I always pick up boxes from the local liquor store. They're kind enough to leave them by the door for anyone to pick up. I never thought of wrapping them. Such a good idea! Thanks for sharing. You are so smart! And here I sit with an unlimited supply of liquor boxes!! You are a dang genius woman. Hi Tuula! What a great way to store things! Card board is usually free for the asking and I'm about to do some asking! Thanks for sharing your clever idea with us! Blessings from Bama!